For me, swimming is a natural complement to running. It is cardio and strength training all in one and oh so easy on the knees compared to running. Plus it is great to focus on the upper body, since running really works the legs. I will admit there are some strokes I used to avoid (and some I think I will never master like Butterfly...hmmm, I see a new goal in my future), like backstroke. I think I swam in fear of bonking my head on the edge of the pool. Now I love it and consider it the most elegant of strokes. So here are a few pointers on my new favorite stroke. To not bonk your head, count the number of pulls it takes to swim the length of the pool if there are no rope or flags hanging near the ends of the pool. Most pools usually hang their flags about 2 yards from the end of the pool. Count how many strokes you do after your head clears the flags before you reach the wall. For me it is 5 pulls and after 5 I just keep one arm above my head and kick until my fingers touch the wall. Keep your head back and imagine you are placing your noggin on a pillow as if to sleep. Keeping your head back and relaxed helps to get your hips and chest up which decreases the drag of your body making you faster and more efficient. Your arms should stay 180 degrees from one another, like a propeller. So one arm will be by your ear with the other by your pelvis. Keep them in close to your body and don't let them wander away from your torso. Rotate your shoulder outward so your pinky enters the water first. You should feel like you are doing a Miss America wave to the sides of the pool. Keep your torso stable from hips up to the shoulders and rotate the torso towards the arm that is pulling - you will twist naturally so don't interfere with the natural rotation. Ideally, you should feel like you are rolling from side to side. You should initiate this move from the pelvis - this also makes it much easier to get the pinky into the water for your pull. Keep the rhythm of your flutter kick (alternating legs) steady and try to do the same number of kicks through each cycle of arm pulls. The legs don't really do much to propel you forward, but the kicking can help stabilize the body. The knee should bend a little as the leg goes down and it doesn't need to go below 30 degrees from horizontal (or the surface of the water). I hope these tips help you learn to love backstroke as much as I do...or at least inspire you to dive into a pool. i can use those tips. 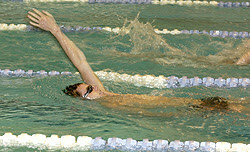 i'm a good swimmer, but the backstroe has always been a problem. I have been learning to swim, forever! Any tips to learn basic swimming? When I learn to swim and come to backstroke, I would use all the above tips. I need all the tips I can get.